November/December 2017. Share Annual Awards 2017. Healthy living at Share. Share flowers. Parents/Carers' Meetings 2018. Season's greetings! 'It'll soon be Christmas!' 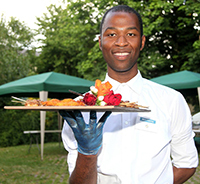 These are the wise words of Share's catering tutor, Kenny. The fact that he says this in January and every month thereafter is niether here nor there!!! It is nevertheless hard to believe it is December again. This inevitably brings an element of reflection – what have we achieved and what are our hopes and dreams for the coming year? 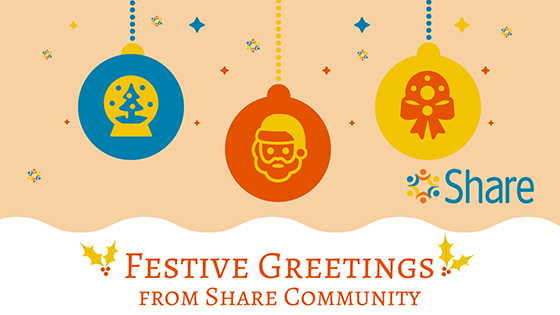 At Share, we only ever have one wish at Christmas, and it is the same one each year: to make this world a better place for disabled people, an inclusive world where diversity is valued and everyone is treated equally. A grand vision for a local charity, but each year we know we take one more step towards our mission to help disabled people realise their potential, have greater choice and independence, and live healthier, happier lives. If the smiles we saw at our recent Awards Day are anything to go by, then we are certainly getting there. Of course there is still much work to do, but we're excited by the challenges that lie ahead and we have so many fantastic ideas and plans for how we can continue to support people to achieve their personal best. So why not join our lovely community and help our Christmas wish come true? As well as donating, there are so many ways to get involved and support Share's work – whether it is through volunteering or providing work experience opportunities for our students or sharing your special skill with our students, we'd love to have you on board! To find out more about Share's work, visit our website at www.sharecommunity.org.uk or contact us via email info@sharecommunity.org.uk or telephone 020 7924 2949. Our Annual Awards Ceremony on 7th November 2017 was a wonderful and joyful day bringing together our students, their families and friends, and our friends and partners in the community. 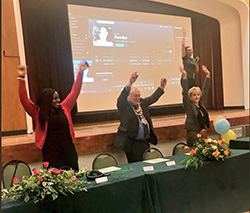 Thank you to the Mayor of Wandsworth, Cllr Leslie McDonnell, and Marsha de Cordova, our local MP for Battersea, as well as our Patron, Patricia Hodge, for joining us at the event this year to help us celebrate our students' considerable successes and achievements. Thank you also to Disability Sports Coach for providing a bit of health and wellbeing for all our guests with a super fun Zumba session. Check out Share's Facebook page for more photos. Over the past few weeks, as part of our healthy living programme, Share students have been taking part in another sports day at the Battersea Sports Centre and learning all about cancer screening. 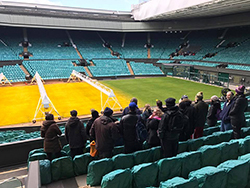 This was followed by a day out at Wimbledon where our students learned how to play ball and picked up a few tennis tips from Wimbledon's head coach, Dan Bloxham. 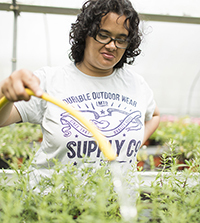 This work has been made possible thanks to a grant awarded in 2015 by the Wimbledon Foundation to promote healthy living among our students and to tackle some of the health inequalities faced by people with learning disabilities. We are immensely grateful to the Foundation for their support and the opportunities they have provided for our students and Share. It's been a joy to see how even small changes in our students' lifestyles are making a huge difference in their overall health and wellbeing. Share's horticulture students are super busy fulfilling their Christmas wreath orders. But did you know Share Gardening also makes flower arrangements? 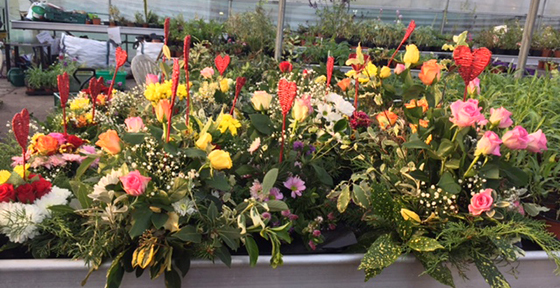 This month, as well as providing the flowers for Awards Day, we created a number of beautiful candle flower arrangements for a local school's Christmas fair. So get in touch if you'd like to brighten up your event with a little floral sparkle from Share. To find out more, contact Sarah Bailes, Share's Horticulture Training Manager, via email sarahb@sharecommunity.org.uk or telephone 07837 180774. 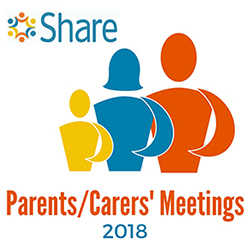 We like to meet regularly with parents and carers of Share students to hear their views, issues and concerns, and to find out how we can help them to support the person they care for. We learn a lot from these sessions. These meetings take place every two months at Share's offices in Battersea. We have now set the dates for our parents/carers' meetings for 2018 so please do join us and have your say. Visit our website for more details. To book your place at one or all of these meetings, contact Annie McDowall, Share's CEO, via email anniem@sharecommunity.org.uk or telephone 020 7801 9817. Well, that's all, folks! All that is left is for us to wish everyone all the very best for the festive period and a happy and peaceful New Year. Thank you to everyone for their support over the past year – this wonderful community thrives because of you and for that we are immensely grateful. Whether you have volunteered, donated, funded a special project, sponsored an event or supported our work through our social enterprises, A HUGE THANK YOU TO YOU ALL! One final reminder that Share will be closing at 5pm on Friday 22nd December 2017 and will reopen as normal on Tuesday 2nd January 2018.